Much has been made of the play of Teemu Selanne and Nicklas Lidstrom the past two seasons as they approached, and passed, their 40th birthdays. They still rank among the best in the world, but are not alone in playing when most others are concentrating on their golf swing. Some are able to not only stick around, but play their best hockey even as time attempts to conspire against them. Just as the NHL has their post season All-Star teams, here are the All-40-And-Over Teams. Their age is as of the final day of the regular season and each player can only appear once. Just missing being added here is Phoenix’s Ray Whitney who turns 40 on May 8. A relative spring chicken compared to some of these guys, Whitney recorded his 1,000th career point on Saturday and has 75 points this season after failing to reach 60 in each of the past two. The Dominator may have been the single toughest goalie to beat ever and despite his unique style of stopping the puck, was able to play at the top of his game well into his 40s. In fact, he still is looking for work in the KHL at 47. In 2006-07, Hasek posted the second highest win total of his career (finishing sixth in the NHL), third lowest goals-against average (second) and fourth highest number of shutouts (second). He is the only goaltender over 40 to win more than 30 games in a season. Lidstrom is the only defenseman to record double-digit goals over 40 and he has done it twice now. He won his seventh Norris Trophy that season, becoming the only 40-year-old and one of only two to win it after 35, with Doug Harvey being the other. At 40, he still led Detroit with 39 power play points and 23:28 played per game and was a First Team All-Star. Ray Bourque finished his career on top after 22 seasons in the NHL. His 52 assists are the most by a defenseman over 40 and third most by any skater. Bourque’s assist, point and plus-minus totals were the highest in five seasons for him. He made his 19th post season All-Star team that season, 13th as a first-teamer. His 26:05 played per game was ninth in the entire league that season and finished first on a powerhouse Colorado club with 31 power play assists. Alex Delvecchio has played more games for a player spending his whole career with one franchise than anyone else, suiting up for 1,549 games with Detroit. His last full season proved to be one of his best as he recorded he second highest assist and point totals of his career and finished in the top three on the team in assists, points and power play goals. 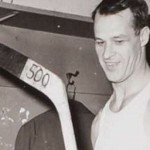 Gordie Howe turned 84 on Saturday and at that age is still only relatively recently removed from his playing career. He added another chapter to his legendary career when he became one of the first players to record 100 points in a season. Howe was 11 years older than Bobby Hull and 14 years older than Phil Esposito who also reached the mark that season. 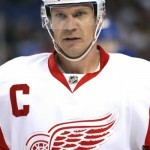 His 103 points are 20 more than anyone else over 40 has ever recorded and led the Red Wings that season in goals, assists, points, power play goals, game-winning goals and was second in plus-minus, shots and shooting percentage. Johnny Bucyk was a reliable scorer for the Bruins for his first 13 seasons in Beantown before exploding for 51 goals and 116 points as a 35-year-old in 1970-71. He ended up recording at least 80 points in five of his final eight seasons, the last of which came as a 40-year-old in 1975-76. Only Howe recorded more goals in a season as a 40-year-old than Bucyk’s 36 that season. He put home 13 power play goals, nine game-winners and had an outstanding 23.8 shooting percentage. At 42, Jacques Plante recorded the second-lowest goals-against average in a full season of his career, unfortunately we don’t know his save percentage as the stat wasn’t kept until 1982-83. 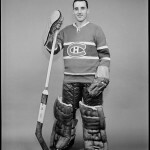 The 24 wins was his highest total since he recorded 42 for the Canadiens in 1961-62. That season he led the NHL in goals-against average, was fourth in shutouts, fifth in wins and was named to the Second All-Star team. His 126 penalty minutes are the most by anyone over 40 and his plus-40 is the second highest total after Howe’s mark. He was second on Detroit, 16th in the NHL in time on ice with 25:18 played and his plus-minus rating was tops among all players. He played in the All-Star Game and was a First Team All-Star at the end of the season. Doug Harvey played only 16 NHL games between 1963-64 and ’67-68, but sent a lot of time in the minors in that span. He came back for a final NHL season with St. Louis at 44 and helped the Blues become the stingiest team in the league, allowing just 157 goals, 39 fewer than the next closest club. He was selected to play in the All-Star Game that year. Mark Messier came back to the Big Apple after a three-season stint in Vancouver and had his best season in four years. His minus-25 may have been the worst rating of his career, but it wasn’t his fault the Rangers were the most porous team in the league that season. He may have no longer been able to single-handedly will a team to victory, but Messier was just as feisty as ever with 89 penalty minutes his highest total in five seasons while leading the Blueshirts in power play goals (12) and shooting percentage (18.3%). 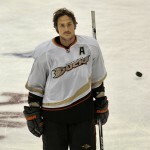 Teemu Selanne (Photo by Herman Von Petri). If Teemu Selanne has lost a step since his 76-goal rookie season, it hasn’t been a big one. Teammate Corey Perry’s late-season surge may have led to a Hart Trophy, but Selanne was every bit as important to the Ducks. His 1.096 point-per-game average is the third-highest ever for a 40-year-old, only after two seasons from Gordie Howe. He finished third in the NHl with 16 power play goals and sixth with 34 power play points. At 40 and in his last full season Dean Prentice recorded the second-highest goal total of his career, netting 26 for the Minnesota North Stars. It was also the second-highest total ever for a 40-year-old left wing and sixth-highest for any position. Prentice finished second on the team with five game-winning goals and a 15.5 shooting percentage and third with five power play goals.